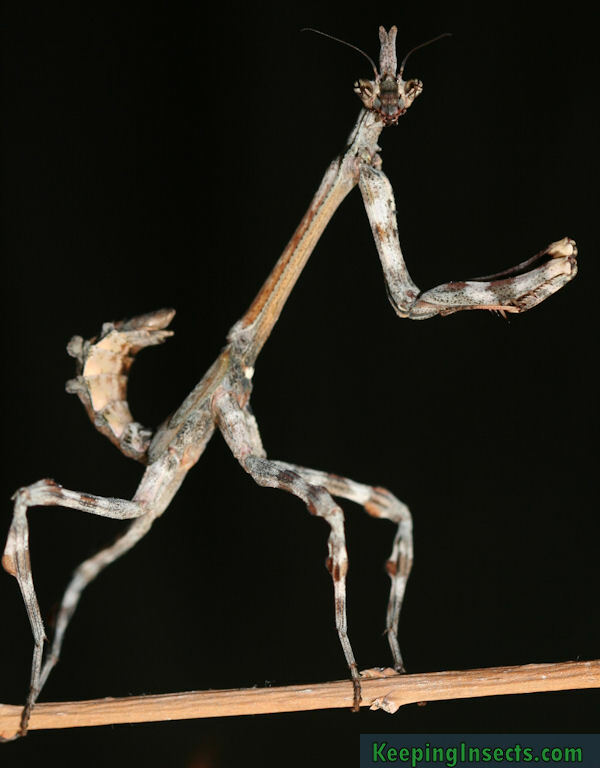 The Arizona Unicorn Mantis, or Pseudovates arizonae is a stick-like praying mantis from North America. It carries the name “Unicorn Mantis” thanks to a small cone in the middle of his head, resembling a unicorn horn! 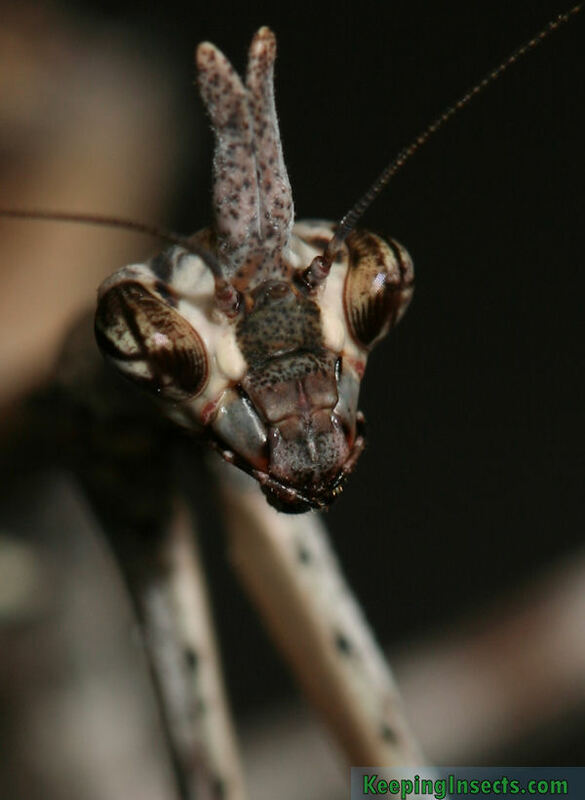 If you take a closer look, you can see the mantis actually has two tiny “horns” next to each other. Pseudovates arizonae occurs naturally in North America, especially Arizona. It is not common in captivity. Some other mantis species, like Phyllobates sp, are also referred to as Unicorn Mantis. 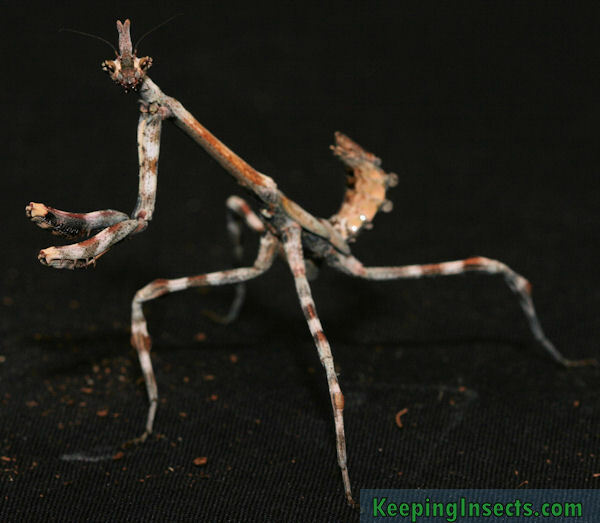 The Unicorn Mantis is dark brown with black and light brown stripes. The legs are striped in light and dark brown. The adults have green wings on a dark brown body, as if there are fresh leaves growing on a branch. On their heads they have a little horn (actually two cones close together). Their front legs are rather thin and slightly curved. The section between the forelegs and the rest of the legs and body is long, smooth and thin as a twig. Their camouflage as a stick is amazing. Pseudovates arizonae will grow until about 6.5 to 7 cm long, with little difference in size between the sexes. The males are thinner with wings that are slightly longer than the abdomen. The females have a wider prothorax than the males and their wings extend to the end of the abdomen. Adult males have much longer antennae than the females. Pseudovates arizonae is a quiet species of praying mantis. It is a typical sit-and-wait predator. Relying on her camouflage it waits patiently until a prey comes along, waiting for an opportune moment to strike. Pseudovates arizonae preferably eat flies, which it can even scoop right out of the air! The ideal temperature is probably about 28 ° C, but can vary between 24 ° C and 33 ° C. At night the temperature can be allowed to drop until 18 ° C.
This species is not really demanding regarding air humidity. Spraying once every 4 days is sufficient to let them drink and stay moist enough to molt. A target humidity is 40% – 50%. As with other species: too much humidity is deadly in the long run! As with all species of praying mantis, this species needs an enclosure that is at least 3 times the length of the animal in height, and at least 2x the length of the animal in width. For an adult this means is at least 21 cm in height and 15 cm in width. A nice size for a terrarium would be 25 x 25 x 30 cm or bigger, so there is room for lots of fake plants and perches. It is best to feed your Unicorn Mantis only flying prey such as flies, moths and butterflies. This species is not very cannibalistic, but cannibalism can still happen. You can try to keep them together in a large enclosure with lots of food, but it is better to keep them in separate enclosures. The older they get the more chance there is that one eats the other. With some proper care and attention it is possible to breed the Arizona Unicorn Mantis is captivity. It is not an easy species to breed, as few people have succeeded. When you buy a Unicorn Mantis in the US it is probably caught in the wild. The females of this species are slightly heavier and broader than the males. When they are older (L6) you can see that the antennae of the males are much thicker and longer than those of the females. You can also look at the number of segments on the abdomen of the mantis, as described here at Distinguishing males and females. Approximately 2 to 4 weeks after the mantis reaches adulthood a mating attempt could be made. Make sure that both partners have eaten a lot in the days before the attempt. Usually Unicorn Mantids are not very aggressive among their own species, but a hungry female will not hesitate to eat the male. Mating can take several hours. The problems in breeding lie mainly in the low fertilization rate and failed matings. The temperature seems to be important during mating, keeping them warmer than 30 ° C has been recommended by the people that managed to breed this species succesfully.